Perfect to use at: Halloween,Xmas celebration, party, street, fancy dress, cosplay etc. Inflatable Pumpkin Costume,Battery operated fan inflates costume in seconds. Super-lightweight terylene (polyester) construction won’t weigh you down! 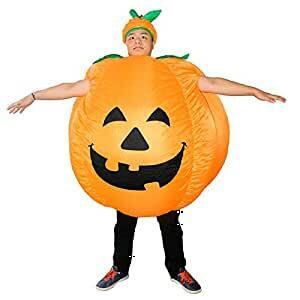 Inflatable pumpkin Costume for Gifts, April Foo’s Day Spoof toys, Indoor and Outdoor Play, Fancy Toy & Games, Parades, Shows, Parks, Zoos, TV Show, Company Celebration or Annual Party, Bars, Club, Carnival, Opening Ceremony, Weddings, Halloween, Christmas, Festivals, Birthday Party, Bachelor Party, Cos Play etc. Orders processed timely after the payment verfication,the goods will be shipped out within 36hrs .Normally,it will take 7-12 business days to arrive. Please feel free to contact us if you have not received your parcel within 15 business days from payment.We will track the shipment and get back to you as soon as possible with a reply.